Today in WHAT?????!!! 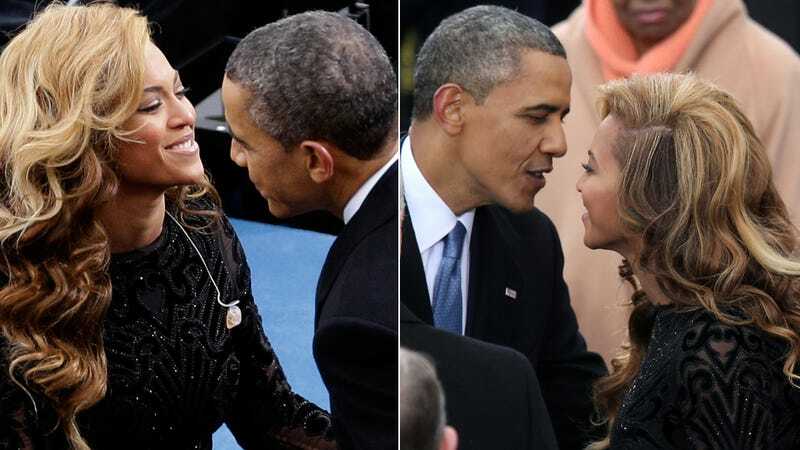 !, a French photographer named Pascal Rostain claims that the President of the United States of America, Barack Obama, is embroiled in a love affair with internationally famous pop star Beyoncé. Oh, and we're going to read about it in the Washington Post tomorrow. "You know, at this time, the United States, there is something big that is happening… Besides, it'll go out tomorrow in the Washington Post, we can not say that it is the gutter press [reporting on an] alleged affair between President Barack Obama and Beyoncé. I can assure you that the world will talk about it." France's President says his private life is private, but he's not denying the affair. Now he will come to America solo for one of Washington's most tradition-bound events, where protocol dictates nearly everything and a slip-up could wind up offending a top ally. Since Hollande's own affair is creating some tension in the White House, maybe this is the French media's way of creating an international distraction. Obviously Rostain's comments are shocking, but Le Figaro makes the point of calling him a "filou" — a rogue, trickster or rascal — with a penchant for provocation. Still, the copy reads, "even when it's in provocation, there is always some truth in what he says." Rostain is not just close to Carla Bruni; he's also friends with Valérie Trierweiler — in fact, he allegedly loaned her his apartment when she needed to see François Hollande in private. There are [photographs and] television images of the Obamas [in which they are] a little distant… It is legitimate to ask questions. We found the same thing [in images] between Holland and Trierweiler. Afterwards, there was the rumor. [Same] for Obama with Beyonce, for example. Just because it's a rumor doesn't mean that one should not go into the field to check. We should not forget Marilyn [Monroe] or Monica Lewinsky. You can be the president of the first world power — that doesn't make you any less a man. So is this just a French guy smugly saying, "Hey, look, our President is not the only one who cheats?" Is the Illuminati behind this? And if this report is true: WHAT? How? Where? Where do either of them find the time? Update, 11:10 a.m.: A spokesperson for The Washington Post says "it's definitely not true" that the paper is planning on running a story about Obama and Beyoncé. Update, February 11: Figaro now reports that Pascal Rostain has backtracked AND retracted. He was joking. Zut.